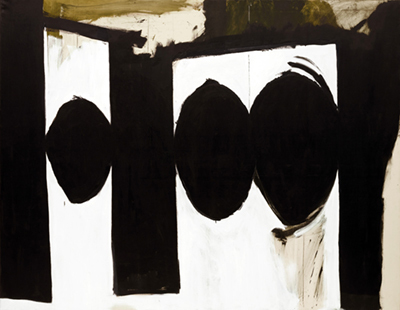 When I saw a painting by Robert Motherwell you can see clearly from the image on the right why it resonated with me. I had found an art style that was truly enigmatic yet had an implied meaning. 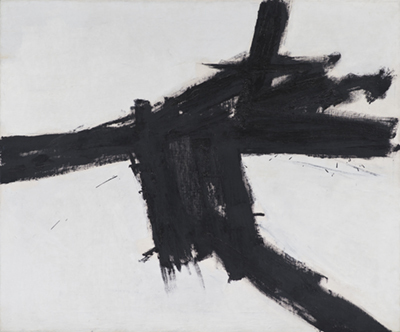 The paintings seen here by Motherwell and Kline represent only themselves and are both a record of the moment of their creation and an imediate experience. The viewer is allowed to construct meaning on a personal level and they are large enough and bold enough to demand attention on a public gallery wall. By which I mean they occupy their space confidently. This was not an art one could copy, to do so would simply be fatuous, but it is in the environment and therefore you could paint it. Remember that for me a painting was a still life, a portrait or a landscape - Another experience of observation. For the next series of paintings I divided a canvas or paper into three areas. The two sides representing the gallery wall (ground) and the central panel a work of art (or subject). It was art within art combining to construct what Barthes (1957) called a meta language. This method of composition is the most fundamental there is for the rectangular surface - the rectangle is in itself a representation of the art object. 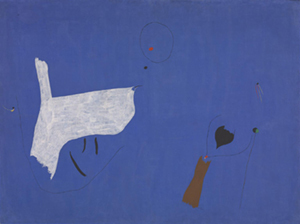 The other artist I was interested in regarding this was Joan Miro, but only particular paintings. I was interested in his codification of colour. I had been using a limited palette of colours for some time, the reason being I wanted to use colour with a specific, although not symbolic purpose. This gave added emphasis to the serial nature of my paintings as one painting used the same colours as the others. Differences become variations.